As one of the first in their area to use sedation techniques for dental treatment, Bethesda cosmetic dentists Deborah Klotz, DDS and Robert Schlossberg, DDS wanted to incorporate a relaxing, tranquil theme throughout their site representative of the benefits afforded by sedation dentistry. To accomplish this, Rosemont Media blended a number of soft blue hues accented by puffy clouds and riverfront DC imagery to create a pleasant and soothing ambience without detracting from the content provided on each web page. In addition to patient-friendly procedural pages and an abundance of office information, the Bethesda Sedation Dentistry site strongly emphasizes smile results and media testimonials—including that of a well-known local radio personality. Behind the scenes, the website is equipped with a responsive design, the industry’s latest dental SEO strategies, and various other elements intended to help Drs. Schlossberg and Klotz gain—and maintain—a strong foothold as leaders in their online marketplace. 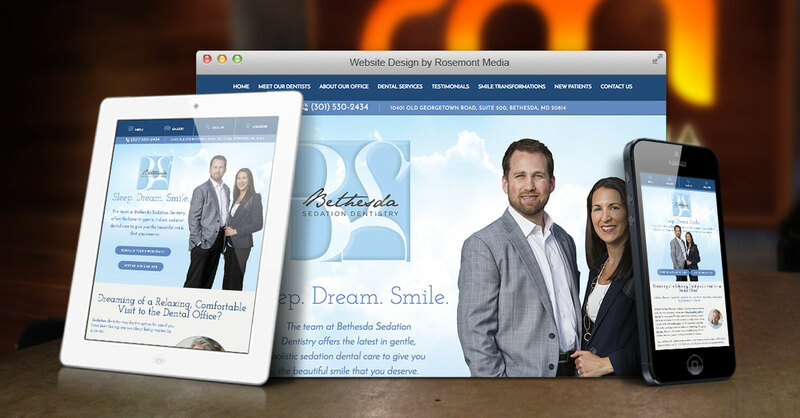 To view the type and quality of website Rosemont Media can custom-design and build for your dental practice, check out www.bethesdasedationdentistry.com.